If you could only have one book in your collection that could cover the vast majority of the history of Nelson Navy, you might be hard pressed to find just one. But I think I have found it. 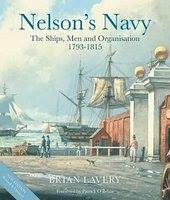 Nelsons Navy written in 1989 by Brian Lavery, a maritime history consultant. Nelson’s Navy is 352 pages divided into 61 lovely chapters examining all aspects of the British Royal Navy from its organization, to ship types, to officers training, the crew, marines, ship handling, life on the ocean waves, dockyards, bases, fleets and ship distribution, tactics, signals, blockading, amphibious operations and much more. Each chapter is very descriptive and includes period paintings, drawings and photos of items from various museums. Also included is a chapter on Foreign Navies of the same time period. A gorgeous Appendix is included that includes charts that cover prices of slop clothes to monthly pay of every sailor on board. The sources index at the end include printed primary sources, secondary sources and even manuscript sources so that you can always go back and find the original source item. So, if I could only have one book in my collection on the Royal Navy this would be it, I believe it is second to none.